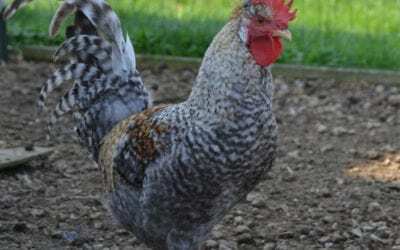 You spent countless hours picking out the perfect chicken breeds so that your backyard flock would lay an assortment of colored eggs, reminiscent of Easter every day of the year. Pastel blues, olive green, light brown, cream, white, and chocolate colored eggs are proudly displayed in that special bowl or egg skelter on your kitchen counter. But now, Easter is approaching and there you are contemplating buying a dozen eggs from the grocery store so that you can have a plain canvas on which to dye eggs for the holiday. What if I told you that you can use your already jewel toned eggs and still have fun decorating the hard-boiled beauties for those Easter baskets? I was struggling with this “problem” this year and here are some ideas that I came up with. Foil eggs. 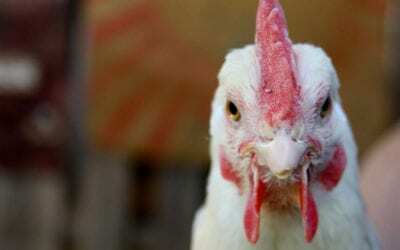 You’ve heard of the goose that laid the golden egg, why shouldn’t those chicken eggs be bedazzled too? 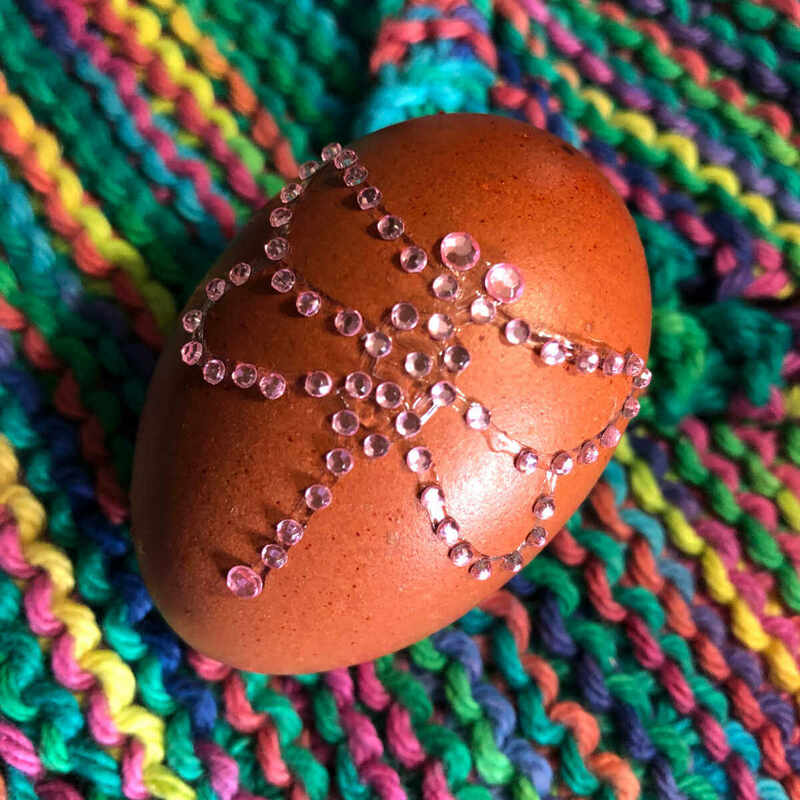 This is a simple and beautiful technique to jazz up any Easter egg, but especially one that is naturally a pretty color. All that you need is gold leaf, metal leaf adhesive, and a stiff brush. Brush the adhesive on your boiled egg and allow to dry for about 30 minutes. You can coat the entire egg or just brush it on in spots for a mottled look. 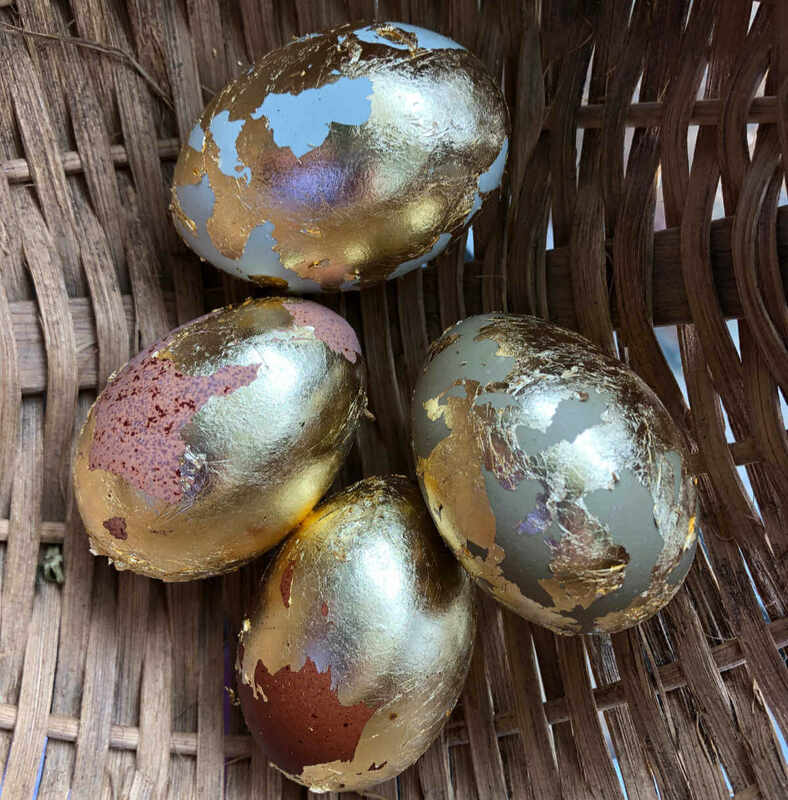 Wrap the gold leaf around the egg, then (if going for a mottled look) brush to smooth out the edges and remove the extra foil. Stickers, stencils, jewels, markers, and more. Get creative! In almost any store this time of year, you will find egg coloring kits. The options seem to be expanding each year and you no longer have just one choice for decorating your Easter eggs. I even saw a kit with emojis for your eggs! We experimented with some jewels and doodle markers from Paas on our colorful eggs (although my youngest decided to use the yellow marker to completely coat his). Use those eggs and color them anyway! I always thought you should have a stark white egg to dye for Easter in order to get the most vibrant colors. 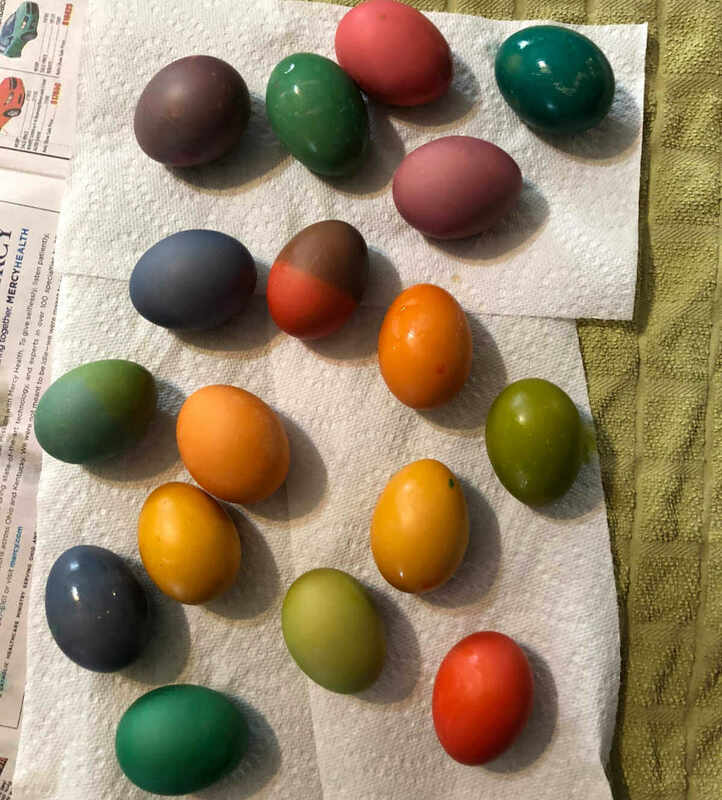 Once I started my own backyard flock and had dozens of brown eggs at my disposal, I learned that brown eggs are even prettier than white eggs when dyed! Go ahead and use your browns, greens, blues, and more and see what color combinations you can come up with. This can even be a fun learning experience for the kids to see the different colors that can be made when mixing two colors. Do you dye Easter eggs, and if you do, what color(s) are your favorite to work with?